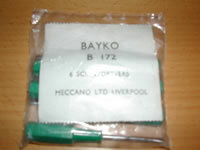 After MECCANO took over BAYKO in 1959 they immediately set about retooling the entire product range, but, as elsewhere in life, dividing lines are never quite that clear cut. …in fact, when MECCANO launched their new parts range in August, 1962, they still had quantifies of conversion sets #0X and #1X sets as well as [unspecified] loose Plimpton era product available. The conversion sets may have been kept available as a service to previous customers, mirroring what Plimpton did, pre-war, when they introduced their 'New Series' range of sets - but the loose stock points to there having been plenty available at the takeover. Immediately after the take-over, it is more than likely that there would also have been significant quantities of raw materials to be used up. …click here to see this interesting Price List. …resulting in various examples of Plimpton era parts in MECCANO era packaging. The first image [above, left] looks, for all the world, like a normal pack of Screwdrivers, but the Screwdrivers inside are the standard Plimpton era green, not MECCANO era grey. The image [right] perhaps helps shed some light on this process, it clearly shows that an improvised label was used, either in haste or, perhaps, because the small quantity didn't warrant setting in motion the full type-setting procedure. 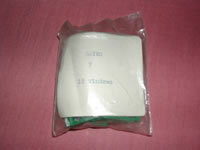 The swapped image [when you roll your mouse over] clearly demonstrates that the pack contents really are Plimpton era Windows. …the earliest MECCANO era BAYKO leaflet showed a similarly confusion of product types. Click here to see the “confused” leaflet.